I noted in my last practice plan that I intended to work with the aLaska Piks I’ve had kicking around now, largely unused, for several months. As someone who primarily finger picks the instrument, nails have been a substantial source of uncertainty and frustration. There’s a whole back story to this latest attempt, which I will now bore you with. As a borderline compulsive nail biter, I started playing the uke with just my finger tips. 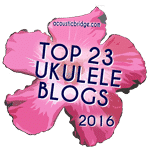 I was quite happy doing this until one day I played the uke with a guitar pick and was blown away by the ringing clarity of the notes. I really wanted that tone in my playing, and I embarked on would would be a sustained and successful effort to grow out the fingernails on my right hand for use in finger picking. Picking with the nails quickly became second nature, and the resulting tone rewarded the effort. All except for my thumb. I have a weirdly shaped thumbnail that causes it to break easily and also be maddeningly far from where it needs to be when playing. The position of my hand when playing has the outer side of my thumb striking the string. Contorting my hand so that the thumbnail could be used is incredibly uncomfortable and awkward, and I’ve been unable to play that way with any success. For some time I went on playing with the side pad of my thumb and nails on the other fingers. I told myself this worked, but as time went on it bothered me more and more and the difference between the tone of notes played by the thumb and the rest of the notes became more and more bothersome. This brings us to the latest attempt. Here’s how it went. I decided to try and get used to a thumb pick. I have a few different kinds, some plastic guitar thumb picks of various thickness, some Herco Medium thumb picks, and of course the thumb-sized aLaska pik. The aLaska pik suffered from much the same problem as my natural thumbnail: the position of my hand just didn’t get the tip of the pick close to the string when striking. The more guitarish thumbpicks would well and I was able to fairly quickly adjust to playing with them. Unfortunately, playing with a pick on the thumb and nails on the rest of my fingers had the opposite affect of what I previously experienced. Now the notes played by the thumb were considerably louder and clearer than notes played with the natural nails. So a final attempt was made at making myself use the aLaska piks. I even followed the advice of some YouTube videos and boiled them in order to fit them more precisely to my fingers, and filed them down a bit around the rough edges. In the end, playing with the finger picks on all fingers was still to uncomfortable and crammed. There was a lot of finger picks bumping into each other, and I could see myself living with wearing these things all the time. So my final resort was regression. I cut and filed down my nails to near non-existent size and am back to playing with finger tips. At first the tone was deeply unsatisfying, and I played very little for a number of days while sulking over this setback. But as I’ve done it more, the tone of the finger tips is growing on me. I can play very quietly, for one. Overall, I feel I have better control over the volume. Most importantly, all the notes share a consistent tone and I’m not suffering uncomfortable finger picks. I’ve been telling myself that I’m not a professional recording musician. If I was, the need for the tone of nails would force me to keep pressing for a solution. But for my purposes, playing with my finger tips keeps it simple and fun and sounds good enough for me. The Ultimate Fingerpick looks promising, and is a design I had considered myself so I’m glad to see someone making it. Unfortunately, they don’t seem to have anything for the thumb. Saddle Thumb Pick is an improved thumb pick. Not sure it really solves my problem; they don’t seem to make picks for the other fingers. The Freedom Pick is an improvement on finger picks, but doesn’t address the thumb. You can tell by all of the upstart finger pick inventors out there that this is yet an unsolved problem for finger pickers. I’m not alone. Cool stuff! I rarely see picks being used to strum the ukulele but its totally cool to use it! I like to use very light acoustic guitar picks on the ukulele seems to work beautifully and brings out the melodies clearly. Thanks for sharing this blog post! Thanks, Eduardo. I’m currently working on growing out my weirdly shaped thumbnail and continuing to play with fingertips in the meantime. This is one thing I can’t seem to let go of. By the way, maybe I didn’t make it clear in my post, but this isn’t about strumming. I’m a finger picker. When I strum, I use my index finger and/or the backs of my nails. Very little of my playing involves strumming, though. Ok I thought this was some weird thing with me so I’m glad to hear you speak of it. My nails don’t grow well either so I tried metal finger- picks- I like the sound but they are clumsy. Plastic finger-picks -break and loosen up, Fake nails- fall off too soon with use… and I continue to obsess about this! Last night I was looking for a piece of felt to glue to a standard pick to see if I liked that sound! Please let me know if you find the perfect pick. Not sure it will suit me but it’s worth a try. Unfortunately not, I’m still playing with my finger tips and have found peace with that. Good luck with your search, though!